Many Talent Trust scholarship and award recipients have gone on to successful careers in the arts at home and abroad. From the Nova Scotia Talent Trust's first 40 years come names like harpsichordist Gordon Murray, organist John Grew, actor Don Allison, singer/actress Peggy Mahon, painter Jean Edmonds Hancock, photographer Sherman Hines, classical guitarist Dale Kavanagh, French horn player David Parker, soprano Sue Doran, and actress Sarah Orenstein. More recently, artists have included dancer Ruth Ellen Kroll Jackson, soprano Jane Archibald, actor Anne Marie Woods, poet Maureen Hull, cellist Denise Djokic, and visual artist Colleen Wolstenholme. The 2018 Special Award Winners were announced at our Special Awards Ceremony on December 11, 2018 at the Central Library in Halifax. Thank you to all who made it a success. 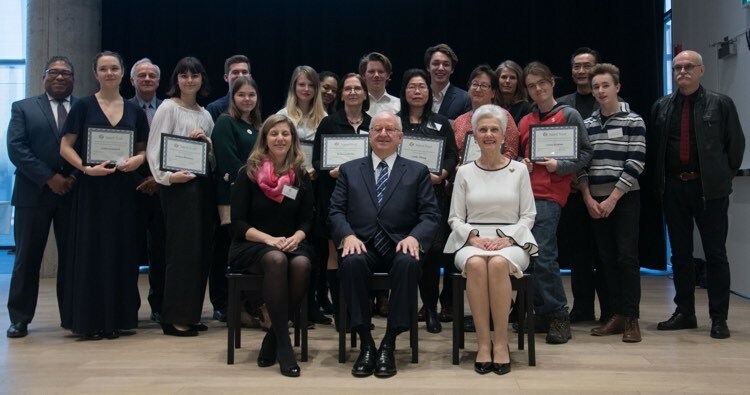 On December 11, 2018 we celebrated the Award winners and Scholarship recipients at the Halifax Central Library (not all of the winners were able to attend due to their study schedule).